K Drama has made its influence over Southeast Asia. The cable TV such as Indovision has shown the acceptance of South Korean artists and singers. Through channel One, K Drama made its success. The television drama known as soap opera is not a simple and unimportant television programme. On the contrary, the soap opera is full of norms to convey to other society and community through the television network. The soap opera also shows the norms that become a dominant discourse in that society, in this case; it shows South Korea’s social norms. This article discusses the K drama in one particular issue such as anti-corruption. The K drama shows the different norms of the old generation which still do the bad business through corruption and gratification, but the younger business persons show the clean and fair competition. To show the anti-corruption in K drama is a way to see and to understand the social norms and social relationship, and how the anti-corruption can be learned as a universal empathy of the larger social change. M SANTOSO, Widjajanti. 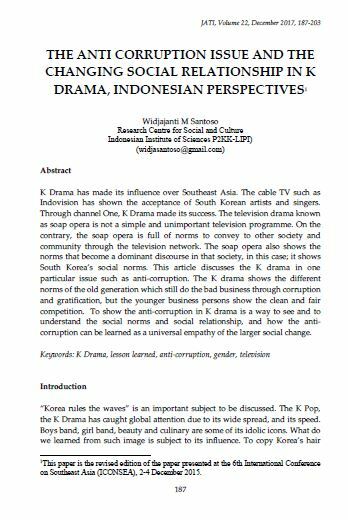 THE ANTI CORRUPTION ISSUE AND THE CHANGING SOCIAL RELATIONSHIP IN K DRAMA, INDONESIAN PERSPECTIVES. JATI - JOURNAL OF SOUTHEAST ASIAN STUDIES, [S.l. ], v. 22, n. 1, p. 187-203, dec. 2017. ISSN 2600-8653. Available at: <https://jati.um.edu.my/article/view/10254>. Date accessed: 20 apr. 2019. doi: https://doi.org/10.22452/jati.vol22no1.13.